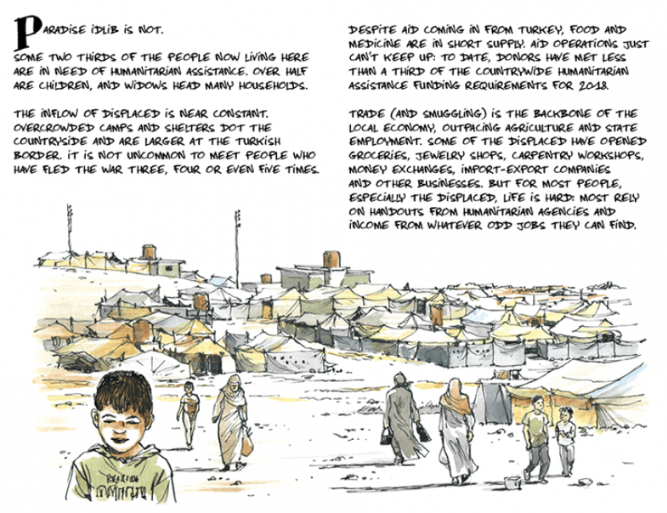 I’m now back at work on Syria and in particular the attacks on hospitals and healthcare (I’ll be drawing on some of this for my Antipode lecture in Cardiff next month). More on that soon, but in the meantime there are two reports that (more than) deserve notice. At least 1,700 people were killed, 5,000 injured, and 158,000 displaced, leaving entire towns empty. In some areas, upwards of 90% of the structures were destroyed. The brutal campaign created a ‘demonstration effect’ and was used to push other besieged areas to surrender with significantly less force. At least eight suspected chemical attacks were launched against civilians and ghters in Eastern Ghouta during the reporting period. In total, an estimated 45 civilians were killed and nearly 700 injured in these attacks. More than 65,000 people, most of them civilians, were forcibly displaced to Idlib and Aleppo in northern Syria as part of the final surrender agreements. 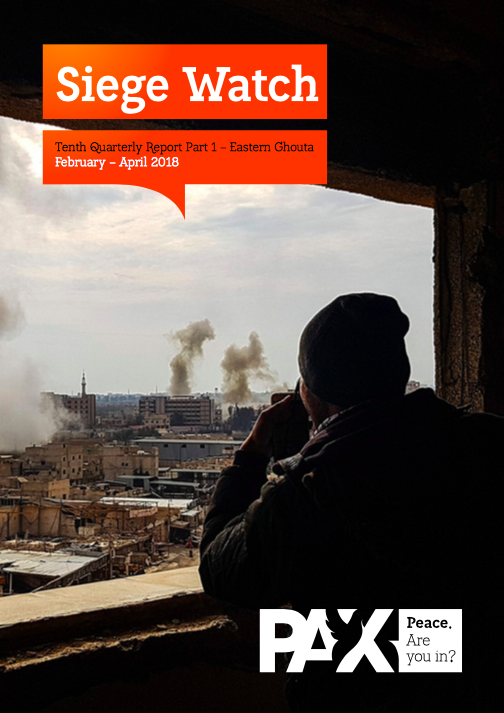 In the wake of the capture of Eastern Ghouta and Jobar by pro-government forces, there were reports of field executions, detentions, threats, and widespread looting. Thousands of men from Eastern Ghouta were forced into mandatory military service. The end of the siege of Eastern Ghouta highlights the government’s demographic engineering strategy. Roughly 200,000 people remained in the enclave by the end of the reporting period – around half of the estimated population from before the offensive began, and just 18% of the area’s pre-war population. I’ll draw on some of the details from the report in my later post. 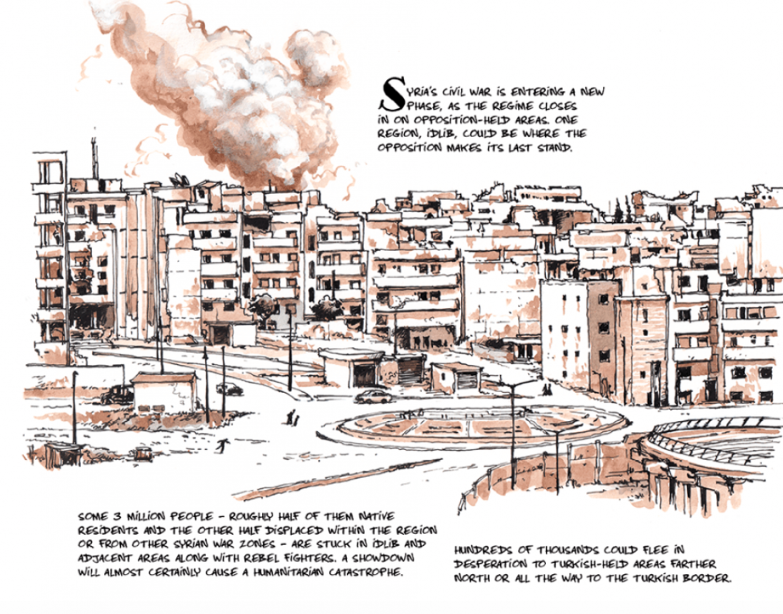 Notice those forced displacements to Idlib, described as ‘an elaborately constructed killbox.’ The International Crisis Group recently published its first illustrated commentary, Voices of Idlib, which you can find here. 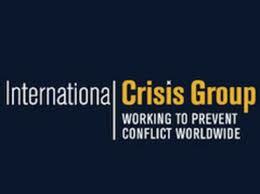 Further to my previous posts on air strikes in Pakistan here and here, the International Crisis Group today published a new report, Drones: Myths and Reality in Pakistan. Pakistan’s new civilian leadership under PML-N leader Nawaz Sharif must make the extension of the state’s writ in FATA the centrepiece of its counter-terrorism agenda, bringing violent extremists to justice and thus diminishing Washington’s perceived need to conduct drone strikes in Pakistan’s tribal belt. Drones are not a long-term solution to the problem they are being deployed to address, since the jihadi groups in FATA will continue to recruit as long as the region remains an ungoverned no-man’s land. 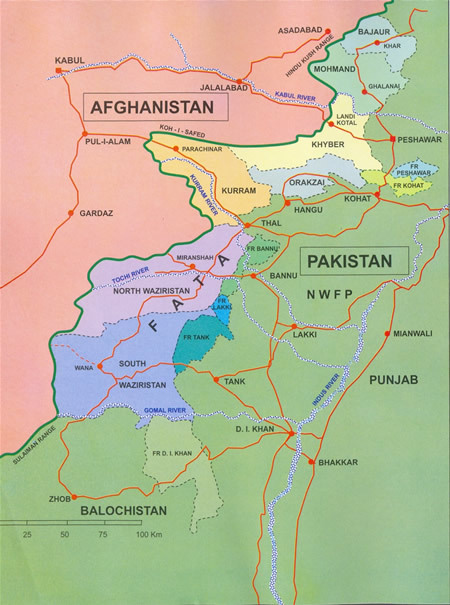 The U.S., while pressuring the Pakistan military to end all support to violent extremists, should also support civilian efforts to bring FATA into the constitutional and legal mainstream. The lack of candour from the U.S. and Pakistan governments on the drone program undermines efforts to assess its legality or its full impact on FATA’s population. The U.S. refuses to officially acknowledge the program; Pakistan portrays it as a violation of national sovereignty, but ample evidence exists of tacit Pakistani consent and, at times, active cooperation. Pakistan must ensure that its actions and those of the U.S. comply with the principles of distinction and proportionality under international humanitarian law. Independent observers should have access to targeted areas, where significant military and militant-imposed barriers have made accurate assessments of the program’s impact, including collateral damage, nearly impossible. The U.S. should cease any practices, such as “signature strikes”, that do not comply with international humanitarian law. The U.S. should develop a legal framework that defines clear roles for the executive, legislative and judicial branches, converting the drone program from a covert CIA operation to a military-run program with a meaningful level of judicial and Congressional oversight. “The core of any Pakistani counter-terrorism strategy in this area should be to incorporate FATA into the country’s legal and constitutional mainstream”, says Samina Ahmed, Crisis Group’s Senior Asia Adviser. “For Pakistan, the solution lies in overhauling an anachronistic governance system so as to establish fundamental constitutional rights and genuine political enfranchisement in FATA, along with a state apparatus capable of upholding the rule of law and bringing violent extremists to justice”. The report speaks directly to claims that the Federally Administered Tribal Areas (FATA) are treated by both Washington and Islamabad as a space of exception, subject to special legal dispensations that expose their inhabitants to military violence and, ultimately, death. And it also repeats much of the argument I made earlier about the close collaboration between Washington and Islamabad based, in part, on the Wikileaks cables. But there’s nothing about the air strikes carried out in the FATA by the Pakistan Air Force. Since the report is specifically about the CIA-directed counter-terrorism campaign, you may think the silence unsurprising. But I think it’s important not to contract the focus in this way – I say that not to exempt the US from criticism (far from it) but as a reminder that this is a space of constructed visibility that is also (as always) a space of constructed invisibility. The inhabitants of FATA deserve to have the wider landscape of military violence exposed to the public gaze. ‘I do think these stories would look quite different if they were being told by people from the countries in question. It would shift perspective, and it would highlight as well as marginalize different aspects of the issue. As it is, the conversation is had among largely American, largely white, largely male voices, and the only real options for the rest of us are either to enter that conversation by agreeing or disagreeing, or risk irrelevance.